Not for the faint-hearted and wimps, Make Up For Ever’s new eye make-up range is pigmented and made to last through stressful board meetings to sweaty gym sessions. The super long-wear Aqua XL range comprises of the Ink Liner liquid eyeliner and the Color Paint cream eyeshadows. The Ink Liner is a stiff sponge-tipped tapered applicator that is good for bold cat eye flicks, and graphic make-up looks. Each pump picks up enough liquid for a full wing-tip. Start each application from the thickest middle part of the cat eye flick as the applicator picks up quite a bit of liquid; leave the finer details to the end of the stroke. The Color Paint shadows make an awesome base for a super bold smokey eye. Just a teeny tiny bit of the cream shadow can be blended out with fingertips (or MUFE shader brush #226) to cover the entire eye socket area. Alternatively, apply with a stiff angle brush for bold coloured lines. Colour sets well and does not budge once dry. Both the Ink Liner and Color Paint are available in 20 shades each, with three textures (matte, metallic and glittery). 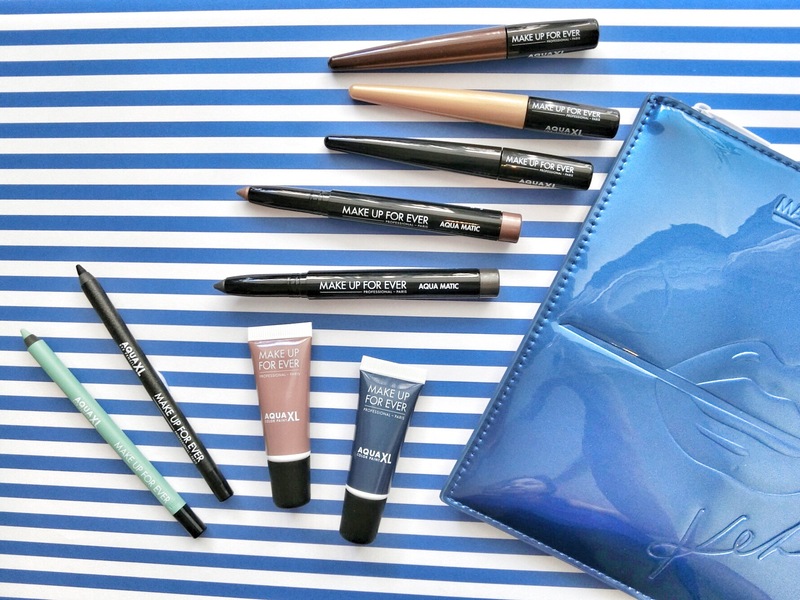 Pair with the Aqua XL Eye Pencil, and Aquamatic shadow crayons for eye make-up that lasts (almost) forever. Aqua XL Ink Liner in ME-42, a glittery gold; D-60, matte brown; M-10, deep matte black.